In close cooperation with the Dutch Refugee foundation, Stichting Vluchteling gave a huge push to our mission and activities: together we started emergency assistance activities for 4000 Batwa Pygmy refugees in North Kivu and since October 2006 we have been providing medical healthcare for Efe Pygmies in Ituri: The Mobile Medical Pygmy Team (MMP Team) is a fact. The nurses are working as 'district nurses'. Kleinood collaborates with and receives support from the responsible medical and church authorities (management of the forest hospitals). The healthcare areas in Congo have separate administrative zones, each with their own responsible doctors. 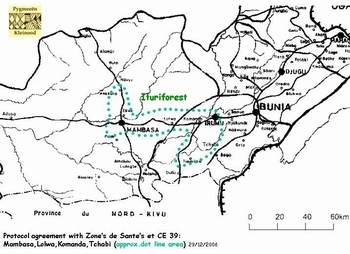 The MMP Team and Kleinood are active in the following medical zones: Komanda (see map), Mambasa, Lolwa and further into the heart of the forest: zone Boga. 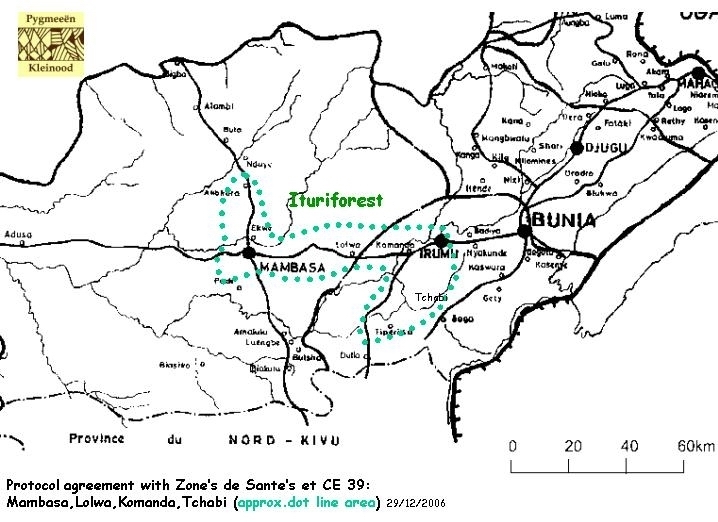 These areas cover a total of 20% of Ituriforest; a very large area for such a small team. It is a tremendous task to visit all the Pygmies in this zone and to treat all the people who are ill; a task too big for a single small team of nurses. Kleinood wants to expand the MMP Team as soon as there are sufficient financial means to achieve this goal. 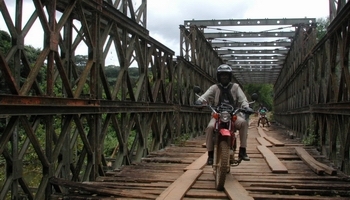 Since early 2007 Kleinood is able to travel to many different Pygmee camps with 2 100cc off-road Yamaha motorcycles. The MMP Team has to enter the forest on foot carrying backpacks containing a standard medicine kit. Papa Kisangani is the "district nurse" who guides the team. His son Paluku, medical student in Lubumbashi, assisted him from mid November until the end of December 2006. They often had overwhelming experiences: so much suffering among the pygmies: completely neglected people, extremely serious cases, pygmies refused at hospitals because of lack of money, see also Medical care).